Nick's Quick Column: Bears have their "workhorse"
For the Bears first game in December, wet-snow filled the air, causing cleats to be changed, gloves to be removed and offensive playbooks to be adjusted. 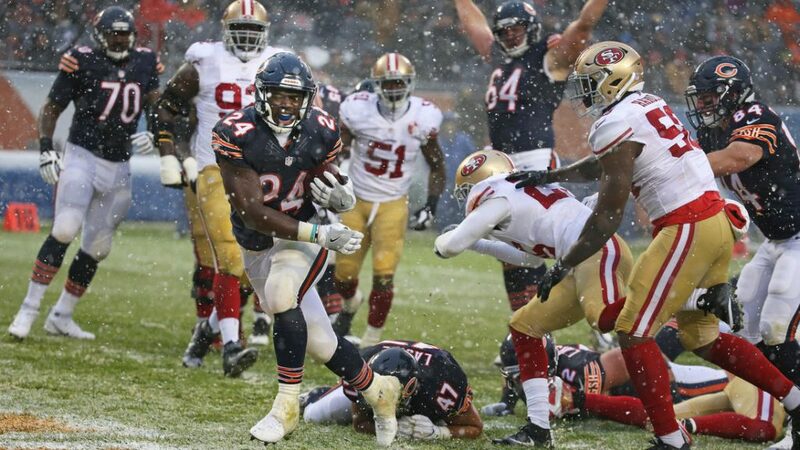 But, one thing didn’t change in the Bears 26-6 win over the 49ers. Jordan Howard’s physical running style. With just under 6:30 left in the third quarter the Bears had first and goal on the 49ers’ six-yard line. Howard got the handoff, kept his legs moving despite the pile of seven 49ers defenders in front of him and made his way to the end zone for his third touchdown on the day. I feel like it’s kind of natural, but it’s something that I had to work on just keeping low pads and keeping my feet moving even when I get hit,” Howard said when asked about being a physical runner. That natural and physical style of play comes from his father, Dr. Reginald B. “DOC” Howard, who passed away from Pulmonary Fibrosis at the age of 52. Underneath Howard’s pads is a cutoff of his father, something Howard has worn in every game since the 7th grade. For the NFL’s My Cause, My Cleats campaign that was held this week, Howard teamed up with the Pulmonary Fibrosis Foundation to wear teal and lime green cleats, the colors that raise awareness for the disease. Due to the field conditions, Howard was unable to wear the cleats for the entire game, but they will still be auctioned off to support NFL and team charities. It’s Howard’s father that fuels him to run with a purpose, to fight for each yard and why he rarely goes down by the first tackler. Howard has shown his physicality ever since he became the full-time starter back in Week 4 against the Lions, where he ran for 111 yards on 23 carries. Only three times this season Howard has carried the ball over 18 times. In those three games, the Bears are 3-0. The rookie has surpassed 100 yards five times this season and is ready to continue that trend. Opposing teams will have to game plan on how to stop Howard, who is starting to create a name for himself with each passing week. Howard currently has 883 rushing yards on the season. He is ranked ninth in the league in terms of rushing yards and ranked fifth in yards per attempt (4.9), tied with rookie running back Ezekiel Elliott. The answer is No. 24. After the victory against the 49ers, Howard was asked whether or not he was ready to carry the load. I’m definitely ready to be the workhorse, even though they might know it’s coming they still have to stop it,” Howard said.